How is import cargo released from Turkey Customs to importer? What is the customs process in Turkey to import? Import cargo clearance in Turkey Customs. Who are the parties involved in import customs clearance formalities in Turkey? The information provided here details on how to import goods to Turkey especially import customs clearance procedures in Turkey. Republic of Turkeys Customs and Trade department looks after import and export related customs procedures of Turkey. Customs needed to import to IZMIR. How can I clear customs to import in MERSIN. What Customs formalities required to import in TRABZON. What should I do to import goods in Ankara. Import customs procedures required in ANTALYA. Import Customs process in Adana. Process to import to DERINCE. Requirements of customs to import to ISKENDERUN d. Customs requirements in ISTANBUL to import. How to get import customs permission in Antalya. 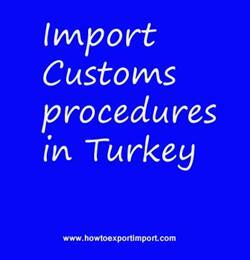 Procedure to get customs clearance to import in Bodrum. Mandatory process need to complete import in Bursa. The way to get customs clearance process to import in Ankara. How to Import to Djibouti? How to import to India from Djibouti? How to export from India to Djibouti? How to export from Zimbabwe? Shanu Sayed : On 14 March 2018 Hello sir hope ua fine..I wud like to know about imports..I wanted to import garments from turkey it is all jeans ..m actually wrking in saudi arabia ..I wanted to know the procedure and wat wil be the duty charges on wat basis..and which cargo wil be better air or sea..do I have to open and account in cargo service in turkey..?? Muhammad riaz shahzad: On 17 December 2018 I want stone crockery import to Istanbul.please need information about complete duty on crockery.